Clayton Moore and Jay Silverheels exemplified what heroes were supposed to be. They started their roles as "The Lone Ranger" and "Tonto" on the T.V. series in 1949 and would continue until 1957. 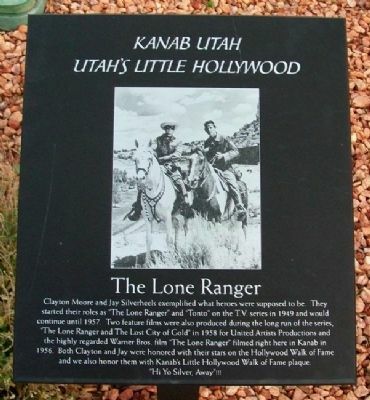 Two feature films were also produced during the long run of the series, "The Lone Ranger and The Lost City of Gold" in 1958 for United Artists Productions and the highly regarded Warner Bros. film "The Lone Ranger" filmed right here in Kanab in 1956. Both Clayton and Jay were honored with their stars on the Hollywood Walk of Fame and we also honor them with Kanab's Little Hollywood Walk of Fame plaque. "Hi Yo Silver, Away"!!! Location. 37° 2.895′ N, 112° 31.654′ W. Marker is in Kanab, Utah, in Kane County. 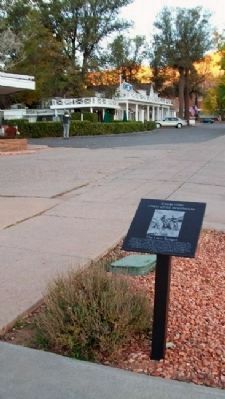 Marker is on Center Street (U.S. 89), on the left when traveling east. Touch for map. Marker is at or near this postal address: 43 East Center Street, Kanab UT 84741, United States of America. Touch for directions. (within shouting distance of this marker); Charlton Heston (within shouting distance of this marker); Johnny Western (within shouting distance of this marker); Dan Haggerty (within shouting distance of this marker); Ronald Reagan (within shouting distance of this marker); Gronway "Gron" Parry (within shouting distance of this marker); Whitney "Whit" Parry (within shouting distance of this marker). Touch for a list and map of all markers in Kanab. More. Search the internet for The Lone Ranger. Credits. This page was last revised on June 16, 2016. This page originally submitted on March 30, 2011, by William Fischer, Jr. of Scranton, Pennsylvania. This page has been viewed 776 times since then and 10 times this year. Photos: 1, 2. submitted on March 30, 2011, by William Fischer, Jr. of Scranton, Pennsylvania.